Kim Coates (born February 21, 1958) is a Canadian-American actor who has worked in both Canadian and American films and television series. He has worked on Broadway portraying Stanley Kowalski in A Streetcar Named Desire and in the lead role of Macbeth performed at the Stratford Shakespeare Festival. He is best known for his role as Alexander "Tig" Trager in the FX series Sons of Anarchy and as Declan Gardiner in the Citytv series Bad Blood. Coates was born in Saskatoon, Saskatchewan, Canada, to Frederick "Fred" and Joyce Coates. He first saw a play while attending the University of Saskatchewan, where he enrolled in a drama course as an elective. This experience inspired him to pursue an acting career. Coates portrayed Stanley Kowalski in A Streetcar Named Desire and was the youngest ever to play the title role of Macbeth at the Stratford Festival in his native Canada. Coates made his screen debut in the film The Boy in Blue (1986). This role opened up opportunities for him, and he has appeared in over 100 titles to date. In 2018 he had his first stage role in almost thirty years, playing Johnny "Rooster" Byron in the Crows Theatre production of Jez Butterworth's play Jerusalem. He won the Dora Mavor Moore Award for Outstanding Performance by a Male in a Principal Role – Play (Large Theatre) at the 2018 Dora Awards. At the 7th Canadian Screen Awards, Coats won the award for Best Actor in a Continuing Leading Dramatic Role for his performance as Declan Gardiner in the television series Bad Blood. Coates lives in Los Angeles, California with his wife, Diana, and two children, Kyla and Brenna. He is known to be good friends with actor William Fichtner, as well as Kevin Costner and Sons of Anarchy co-star Theo Rossi. Kim became a United States citizen in 2010. 1987 Miami Vice Gang Member Episode: "Viking Bikers from Hell"
1988 War of the Worlds Scott Episode: "To Heal the Leper"
Poltergeist: The Legacy Steven Romero Episode: "Transference"
2002 Earth: Final Conflict Smoke McBride Episode: "Deportation"
2004 CSI: Crime Scene Investigation Drake Snow Episode: "Early Rollout"
CSI: NY Detective Vicaro Episode: "Hush"
The Dresden Files Sirota 1 episode: "Rules of Engagement"
2008 Cold Case Alessandro Rossilini Episode: "Sabotage"
2010 Human Target Bertram Episode: "Salvage & Reclamation"
Kevin Can Wait Terry Labasco Episode: "Unholy War"
^ "Kim Coates Film Reference biography". Filmreference.com. Retrieved 2017-06-26. ^ "'Green & White: Fall 2000: "Kim Coates - U of S grad finds success in Hollywood"'". Usask.ca. 2014-05-15. Retrieved 2017-06-26. ^ "Review: Play Jerusalem triumphs as a pure theatre of the kind we rarely see". The Globe and Mail, February 16, 2018. ^ "In return to theatre, Kim Coates wins big at Toronto's Dora Mavor Moore awards". Saskatoon Star-Phoenix, June 27, 2018. ^ "'Anne With an E,' 'Letterkenny' Win Big at Canadian Screen Awards". The Hollywood Reporter, March 31, 2019. ^ "Alex 'Tig' Trager (Kim Coates)". Sons-of-anarchy.maxupdates.tv. Retrieved December 13, 2012. 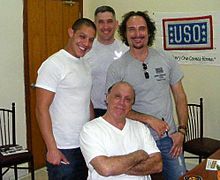 ^ "'Sons of Anarchy' Star Kim Coates Talks Season 4, Tig Tattoos and Hanging With Stephen King". Aoltv.com. Retrieved December 13, 2012. ^ "With 100 acting credits in three decades, Kim Coates has been in everything". Saskatoon StarPhoenix. 2017-01-27. Retrieved 2017-10-20. ^ Name (required) (2013-06-18). "2nd PAAFTJ Television Awards nominations announced; "Arrested Development" leads | Pan-American Association of Film & Television Journalists". Paaftj.wordpress.com. Retrieved 2017-06-26. Wikimedia Commons has media related to Kim Coates.